What's Really Going on in Wisconsin? The assault on collective bargaining isn’t about the deficit—it's about politics. Anti-labor forces have waited decades for the opportunity that they are now trying to seize in Wisconsin. Republican Governor Scott Walker’s plan, echoed in proposals put forward by several other conservative governors, to take away the collective bargaining rights of most Wisconsin public employees under the guise of deficit reduction represents a bold effort to undo a half-century of labor history. It would turn back the clock to the early 1950s, a time when public workers still labored under a form a second-class citizenship. The goal? Republicans insist it is to spur economic growth—but, in fact, it is to undermine organized labor as a political actor. Following the example of cities like New York and Philadelphia, in 1959, Wisconsin became the first state to enact legislation recognizing the rights of government workers to bargain collectively. Similar laws spread in subsequent years, encouraged by Wisconsin’s law and inspired by Executive Order 10988, signed by President John F. Kennedy in 1962, which allowed federal workers to bargain over some aspects of their work (but not their pay or benefits). Critically, this growth enjoyed bipartisan support: Governor Ronald Reagan signed the Meyers-Milias-Brown Act in 1968, which brought public sector bargaining to California. Through his own executive order in 1969, President Richard Nixon strengthened the bargaining rights Kennedy had first offered federal workers. As a result of this support on both sides of the aisle, between the mid-’50s and the mid-’70s, there was a tenfold increase in the membership of government workers’ unions. But, since 1970, bi-partisan support for government unions has eroded. By the middle of the decade, anti-union voices on the right, alarmed by the rising political influence of public-sector unions, had begun a long battle to roll back collective bargaining—the same battle we’re seeing waged today in Madison. But now, in the midst of the worst economic crisis since the Great Depression, conservative, anti-labor politicians like Governor Walker are trying out a new and potentially more potent anti-union argument: We can no longer afford collective bargaining. The wages, health benefits, and pensions of government workers, these opponents say, are driving states into deep and dangerous deficits. Yet this contention is every bit as bogus as the alarmist arguments put forth by the anti-union crusaders of the 1970s. Contrary to Walker’s assertion, there is no direct correlation between public-sector collective bargaining and yawning state budget deficits. According to data gathered by the Center for Budget and Policy Priorities, while Wisconsin projects a state budget deficit of 12.8 percent for FY 2012, North Carolina, which does not allow government workers to bargain, faces a significantly higher deficit: 20 percent. Ohio, whose Republican governor John Kasich has also made clear his desire to roll back collective bargaining, has a deficit that is only about half the size of non-union North Carolina’s. Clearly, then, state budget deficits we are now witnessing are not the product of collective bargaining, but rather reflect the differential impact of the current recession on individual states, as well as the integrity of state fiscal practices (such as whether they raise enough in taxes to pay for the essential services they provide). Such facts apparently matter little to Walker, Kasich, and their ilk. They have taken to heart the famous quip by the right wing’s bête noire, Rahm Emanuel: “You never want a serious crisis to go to waste.” Exploiting the suffering of so many during this “Great Recession,” they are seeking to turn hurting private-sector workers against their supposedly “privileged” public-sector counterparts in a perverse new form of class warfare, the end results of which will only accelerate the downward pressure on incomes and benefits that has contributed to a new gilded age of wealth inequality in America. What proponents of the rollback in public-sector bargaining rights are unable to explain is how taking rights away from some American workers will improve the lot of others. How will denying collective bargaining rights for teachers, social workers, or parks employees in Wisconsin create good jobs in the private sector? How will taking away the rights of prison guards to bargain collectively in Ohio keep manufacturing jobs in the United States? How will reducing the pensions promised to government workers (often in return for their agreement to forego salary increases) create retirement security for private sector workers whose paltry 401Ks are unable to support them? How will holding down public-sector pay stop the erosion of the American middle-class—of which public-sector workers constitute a significant proportion? Of course, there are no serious answers to such questions, because what Republicans are now seeking in Wisconsin and elsewhere has nothing to do with helping put America back to work. It is really all about politics. 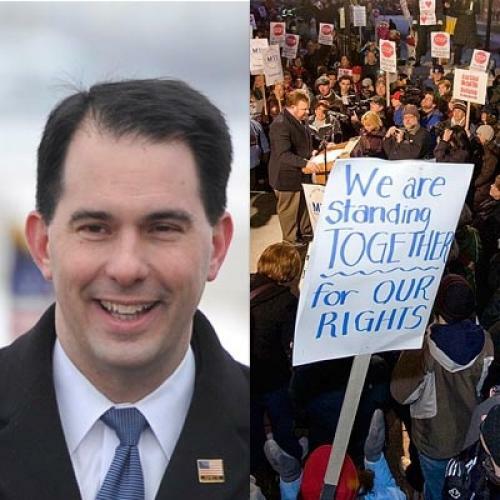 As the protests that have erupted in Madison over the past few days remind us, even in its weakened state, the labor movement can still mobilize grassroots opposition to the anti-government agenda of Tea Party Republicans like Walker. It is precisely this capability that Walker and others are determined to undermine by taking away workers’ rights to union representation. No matter what conservative governors say, the extension of collective-bargaining to public-sector workers is not what entangled us in the current economic crisis. Indeed, what is going on in Wisconsin and other states ought to be seen for what it is: a bald attempt to exploit the bad economy, undo 50 years of legal precedent on labor issues, and win a political victory, no matter the cost. Joseph A. McCartin is an associate professor of history and director of the Kalmanovitz Initiative for Labor and the Working Poor at Georgetown University. This fall, Oxford University Press will publish his book Collision Course: Ronald Reagan, the Air Traffic Controllers, and the Strike that Changed America.